(Nanowerk News) The electrical and mechanical responses of crystal materials, and the control of their coupled effect, form one of the central themes in material science. They are vital to applications such as ultrasonic generators and non-volatile memory. However, despite knowledge of how to control such materials being widely demonstrated in practice, to date the physical principle behind the controllability through lattice organization, remains undefined. Researchers at The University of Tokyo Institute of Industrial Science have sought to change this by creating a model based on the conflict between different lattice interactions. Their findings were published in PNAS ("Self-organization into ferroelectric and antiferroelectric crystals via the interplay between particle shape and dipolar interaction"). Crystal structures comprise atoms or molecules and the particular organization and interaction of these component parts dictate the properties of the bulk material. 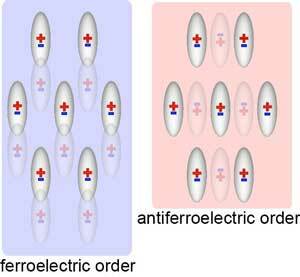 Ferroelectric and antiferroelectric ordering describe long-range dipole based arrangements of molecules in a lattice. Materials exhibiting such order can show electrical switchability, as well as interesting cross-coupling effects; therefore, understanding their behavior has tangible practical benefits. "Our model was designed to probe the simple physical principle that controls ferroelectric and antiferroelectric order by varying the shape of the molecules in a dipolar lattice," study corresponding author Hajime Tanaka says. "We also compared the resulting effects on the electrical, dynamic, and thermal properties." Creating a simple self-organization model based on spherical particles with a permanent dipole allowed the researchers to establish the importance of the energetic frustration between the anisotropic steric and dipolar interactions in the self-organization process. "Understanding the underlying principle that governs ferroelectric and antiferroelectric organization and transitions is key to achieving optimal control of the properties that are already being utilized in many different applications," lead author Kyohei Takae says. "By carrying out thorough modeling of these systems we hope to be able to enhance the rational design of a wide range of materials including non-volatile memory devices--hard drives and flash memory--and electro-mechanical actuators, used in robotic instruments." The findings are expected to provide important guidelines for the development of highly functional materials that show cross reaction in which electric/magnetic order and deformation or thermal response are combined, using substances showing phase transition between ferroelectric ordered phase and antiferroelectric ordered phase, or magnets.